These bloomers have a traditional shape with a simple eyelet ruffle hem. They are designed to be worn under dresses with the ruffles peeking out the bottom. In cooler weather the eyelets double as buttonholes for a set of leg warmers. Cute and functional! Knit them in wool for use as a cloth diaper cover or in a cotton blend for a potty-trained child. Instructions are given for solid color or two-tone bloomers in six sizes from birth to 4T. 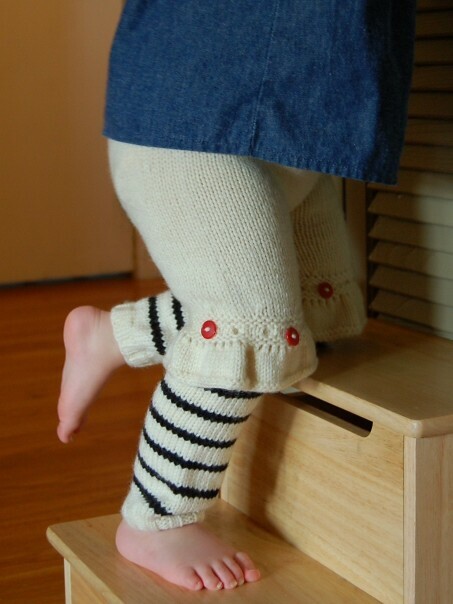 Three cuff options are provided for leg warmers. Knit them in a variety of colors and styles, and mix-n-match! Yarn: In worsted or aran weight yarn you will need approximately 130 (150, 180, 210, 260, 320) yards for bloomers and 70 (80, 90, 100, 115, 130) yards for leg warmers. If you choose a contrasting color yarn for the ribbing and eyelet borders on your bloomers it should be about 25% of your total yardage. Only a small amount of CC is needed for leg warmers. Needles: Double pointed needles (or needles appropriate for your preferred method of small circumference circular knitting) and 12” or 16” circular needles in US sizes 8, 7, and 6 (or size required to obtain gauge and needles one and two sizes smaller). Notions: Scrap yarn, 4 stitch markers, darning needle for weaving in ends, 8 buttons (5/8” - 3/4” work well, but I recommend taking the finished bloomers to the store to pick out buttons. Be sure to buy buttons that are snug passing through the eyelets so your leg warmers stay firmly attached. For larger sizes you may want to add more buttons. Just be sure they are matched up to the eyelets. In stockinette stitch 20 sts = 4” using the larger needle size.